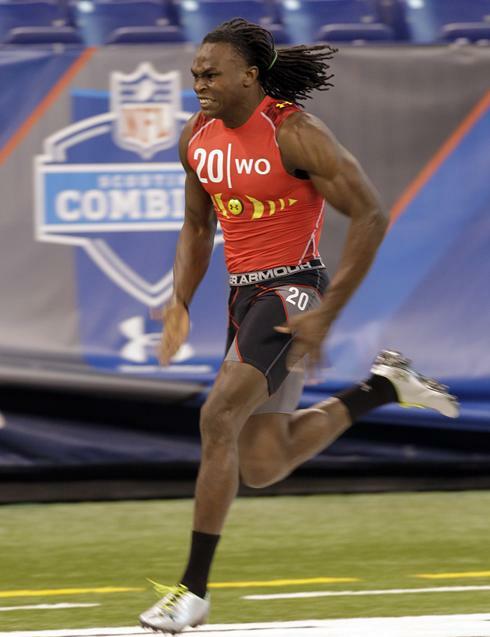 The NFL's Annual Combine is over and all the results are now official. While Scouts swear that what happens at the event is only a small part of their total evaluation, it still impacts a prospects draft stock significantly. The ability to score one prospect directly against another on an even playing field is absolutely going to have an effect on evaluators and team management's perception of a prospects relative value. I think what makes the Combine such a determinate factor in a prospects big rise or fall on draft boards is the proximity to the draft itself. It is the last "real" time they will get to see him perform before the draft. Yes, I know most guys have Pro-Days but those are so regimented it's nearly impossible to look bad and if someone does, the chances are good that they didn't have a very good combine either. Anyway, the fun part for us NFL fans is assuming the role of a scout and adjusting our own Big Boards with the information we gained from the workouts. Some guys crushed it and some guys flopped, so let's check out a few of each. Julio Jones, WR - Julio dominated the Combine from start to finish. He showed up in ridiculous shape and displayed his athleticism in just about every measurable. His 4.39 time in the 40 yard dash was good enough for 7th overall and tops in the WR group, his 38.5 vertical leap was 7th for WRs, the 11'3" he registered in the broad jump was 4" beyond the 2nd best in the entire combine and that is just the one that he was able to land he jumped further on other jumps but wasn't able to hold it. Marvin Austin, DT - Austin missed the 2010 season due to a suspension for improper contact with a scout. However, before that he was a very highly regarded DT prospect and he reminded everyone why this weekend. His 4.9 in the 40 and 38 reps on the bench show that he has remarkable strength and surprising speed for a guy who weighs 309 lbs. 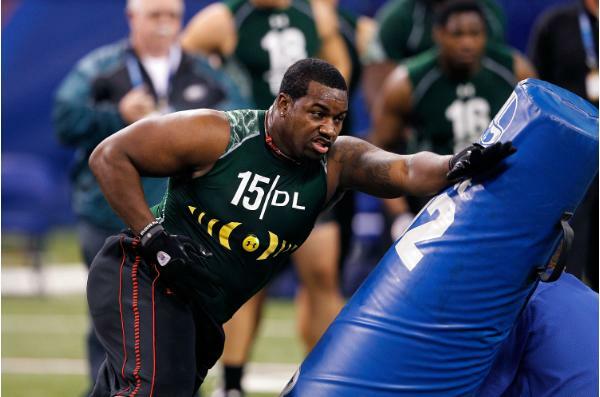 Marcell Dareus, DT - Dareus weighed in at 319 lbs which was 28 lbs more than fellow top ranked DT, Nick Fairley, a significant difference. Significant because he was only .06 seconds behind Fairley in the 40 with a time of 4.93 and looked pretty athletic in most of the drills. Patrick Peterson, CB - Nobody doubted that Peterson could turn in a fast time and while he didn't live up to his 4.2 hype, he ran an official 4.34 in the 40 at 219 lbs. Peterson also looked really smooth through the DB drills and solidified himself as the top CB if not the top prospect in the entire draft. Roy Helu, RB - Helu came to the combine as a late round prospect but surely opened some eyes to his incredible speed and athleticism. He was at the top of nearly every measurable number and set the recent combine best for an RB in the 20 and 60 yard shuttles. Helu definitely improved his draft stock with that performance. Akeem Ayers, OLB - Ayers is supposed to be an athletic freak but he sure didn't test like one. Granted his numbers are way better than most people but he was really supposed to stand out from the crowd at the Combine but he came away looking very middle of the pack. There is a chance that this will cause his stock to drop him to the end of or maybe even out of the 1st round. Vincent Brown, WR - Brown was a fringe 2nd round prospect due to huge productivity while at SDSU but his disappointing workout has probably made teams drop him way down their board. While his stats are huge they were usually coming against 2nd tier competition. That means he was really going to have to stand out athletically at the Combine to solidify any kind of draft ranking but a 4.71 in the 40 at 5'11" and 185 lbs isn't going to help anyone out. Jacquizz Rodgers, RB - I didn't want to put the incredibly named 'Quizz in this list even though he really should be. While lots of scouts say that these measurables really don't matter, they do for some people. Those people usually include small school guys and small guys. Both have to prove that they have the speed and explosiveness to hang with the big boys. Unfortunately 'Quizz did not show up big at the Combine. He ran one of the slowest 40's for an RB after Wisco's plow-horse John Clay with 4.64 plus his vertical leap and 3 cone drill numbers were way down the list too. There are a few other guys who could be included in both lists but I'll highlight a few that I really liked who had great days. Specifically Von Miller, Christian Ponder, and Leonard Hankerson looked fantastic. While Miller may have cemented himself as a Top 5 prospect with over 10 extra lbs of added bulk and a blazing 4.53 in the 40, Ponder and Hankerson could both be potential 1st round picks if everything goes smoothly for them over the next two months. For those guys who disappointed this weekend, they will have a 2nd chance at their school's Pro Day in the next few weeks. Speaking of Mallett, every report I read said that he had the best arm and best accuracy of anyone there. All the bad press he has been getting makes for a great story but it certainly does NOT make a bad QB. Bad rapport with reporters is often mentioned as a big negative but I have to think that is much more of a writer's point of view than a coaches.'. I've never heard a coach say that he didn't like a prospect because the kid had a bad relationship with the press. All of that is to say that Mallett had a good Combine as far as the teams are concerned.